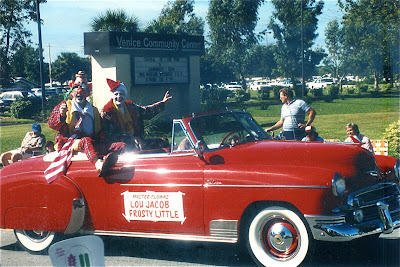 I'm deeply saddened to learn of the passing of Mr. Fred Collins. 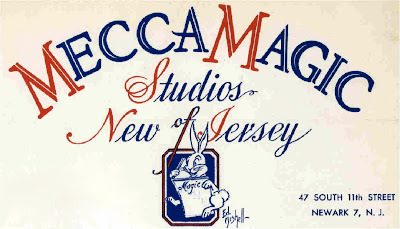 Anyone who ever worked in the variety arts in the NJ area knew Fred and his shop, Mecca Magic. I've known Fred Collins since I was 13 years old and walked into a real magic shop for the first time. Mecca Magic was everything a real magic shop ought to be and Fred was everything you could ask for in a magic shop owner. A very talented, very generous man, he will be very sorely missed. From the film GOLD DIGGERS IN PARIS. 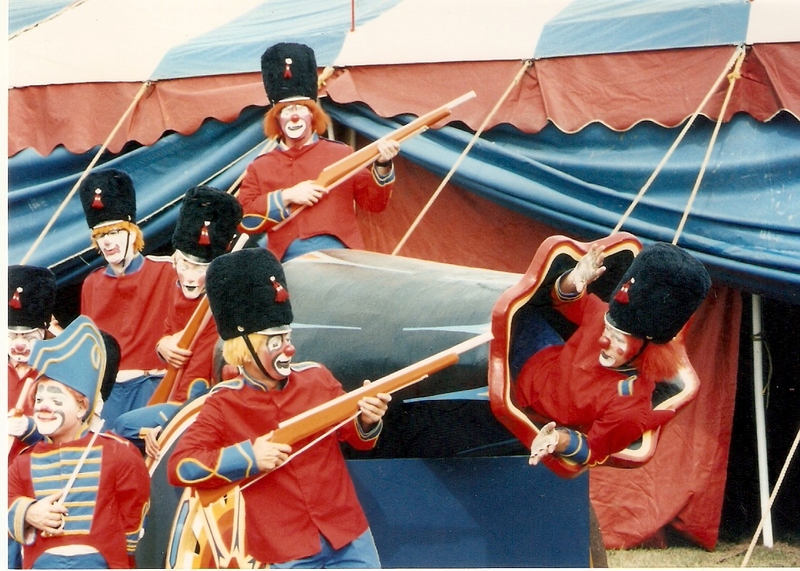 George Rock, soon to leave for Spike Jones and the City Slickers, is on trumpet. 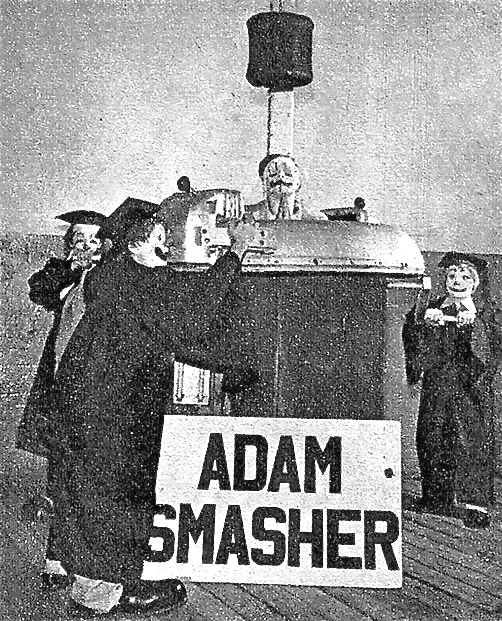 Paul Jung's classic "Adam Smasher" with Paul Jung out in front, Ernie "Blinko" Burch assisting on the left and it looks like Frank Luley on the right. I'm not sure who is playing "Adam" but I'll bet dollars to donuts that Prince Paul is one of the dwarves stuffed inside, ready to run out when that weight falls. 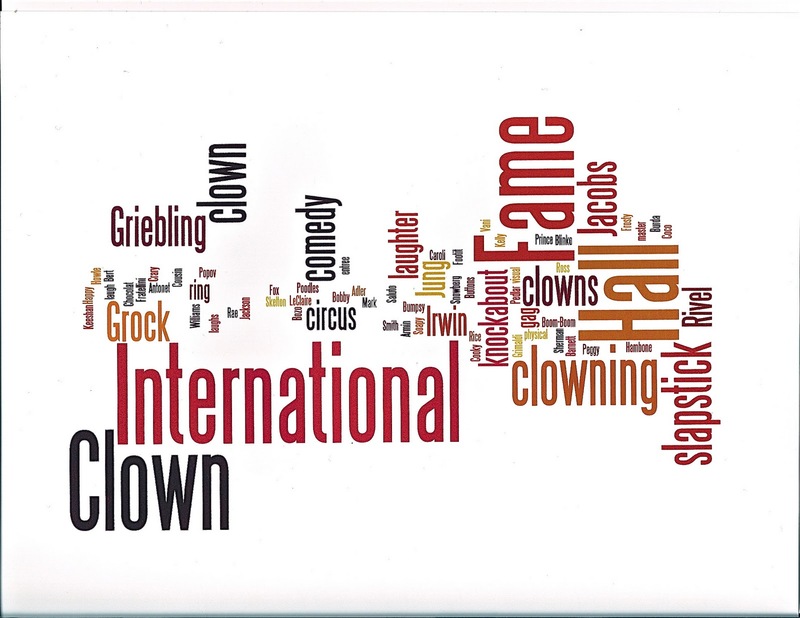 Gem City Amusements of Baraboo, Wisconsin has created these special edition candy bars just for the International Clown Hall of Fame and Research Center! Help support the Hall of Fame. Proceeds from these candy bars goes directly to help with our projects and preservation. You get six (6) Handmade Gourmet Milk Chocolate Bars produced by Gem City Candy Company right next door to the Clown Hall of Fame in Baraboo. You will receive three (3) Solid Gourmet Milk Chocolate Bars and three (3) Gourmet Milk Chocolate Bars sprinkled inside and out with candy confetti "balloons". These Bars are specially labeled with the Clown Hall of Fame logo and inductees to the Hall of Fame. 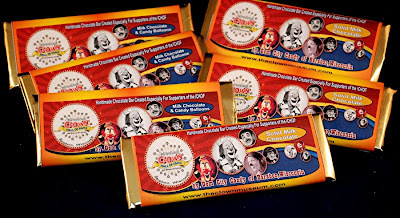 These special Candy Bars are available directly from us to benefit the Clown Hall of Fame. Please lend a hand and assist the efforts of the International Clown Hall of Fame and have fun doing it. Anyone who has ever stopped by Ralph Pierce's shop knows that these are the finest quality chocolate bars you are ever going to taste. "I put this gag (a variation of Paul Jung's military gag) together to parody the human cannonball on Beatty-Cole. Fortunately we got the spot directly following the human cannonball and it went over well. 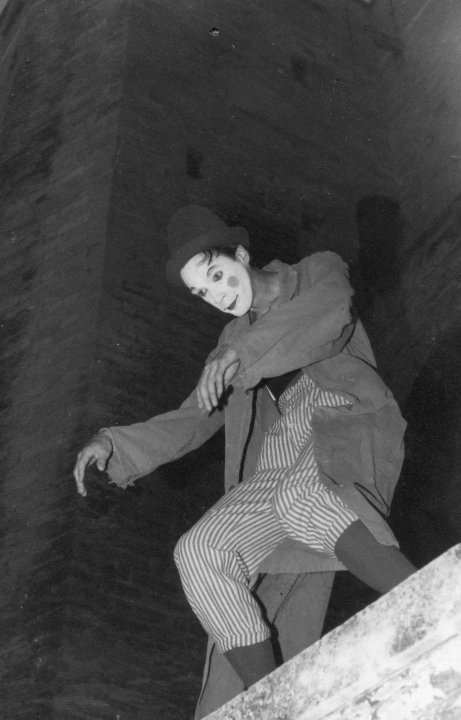 This was the first public performance. 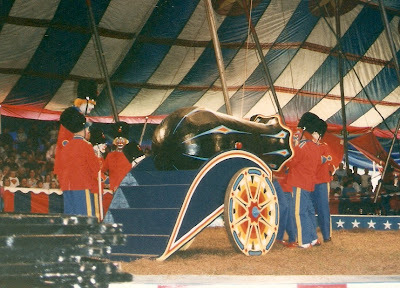 We had to stall forever, as the prop crew managed to bury the cannon prop behind a trampoline Look for knock-off head (behind pole) and trick cannon flipping over. 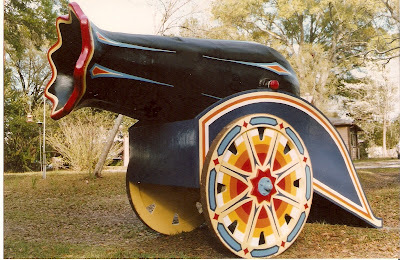 Explosion and smoke as well." Lou Jacobs, his wife Jean and daughters Dolly and Lou Ann. 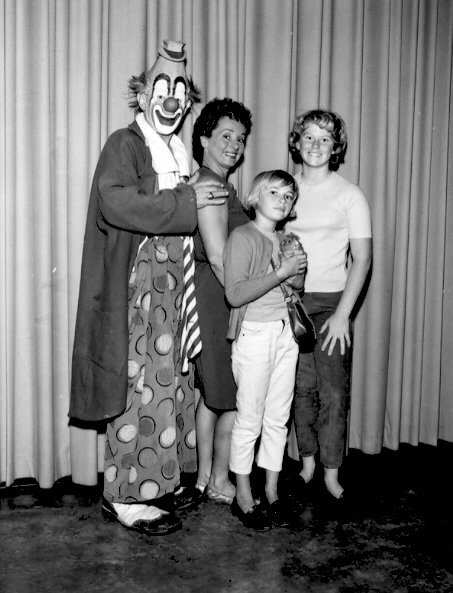 Lou is wearing what might be the single greatest pair of clown pants in the history of the circus and I believe that if you look closely you'll see Dolly is holding a pet guinea pig. George Carl's first Carson appearance, including the introduction and the snub by Carson at the end. Kiss Meets the Phantom of the Park, The Star Wars Holiday Special, Legends of the Super Heroes and now this. The 70s were indeed a shameful time in our nation's history.